A Very Short Walk to Hardings Beach. Less than 10 minute walk down a private neighborhood path down the sand dunes to Hardings Beach. Classic, clean, peaceful cape cod home in a safe, quiet family neighborhood--10 minute walk down a private neighborhood path over the sand dunes to Hardings Beach. Home has been completely remodeled with granite countertops, all new appliances, Anderson windows, wide pine floors, and all new furnishings. Lots of living space in the living/dining areas and on the deck! Gorgeous updated kitchen with all stainless appliances. Central air conditioning. High speed internet and WIFI helps you stay connected as well. Beautiful seashell driveway with seashell paths leading to the outdoor shower, hammock and deck overlooking the grassy backyard which is big enough for ball-playing or bean-bag toss, etc. Friends and family members will enjoy the peaceful walks by the ocean. Entertain on the back deck with gas grill. Parents will appreciate the peaceful, quiet and safe neighborhood. Walk past nine houses to arrive at the private neighborhood path over the sand dunes to Hardings Beach. You can also walk to Barn Hill Landing where you can watch lobster boats, or fish from the dock. You can also rent kayaks and paddleboards on the scenic ocean harbor of Oyster Pond, which leads to Chatham Village. Bright, sunny rooms make this the perfect, peaceful beach retreat! Sleeps 8~~One King, One Queen, Twin Bunks, Trundle Day Bed, and Double Pull out sofa. While renting this property, you can walk 1/5th of a mile to Hardings Beach within the private neighborhood, and follow the path over the sand dunes down to the beach. Hardings beach has a lifeguard during the summer months, and is safe for young children. There are few waves at this beach and the water is relatively warm because it is protected by the Nantucket Sound. Kids will have fun catching sand crabs, following the sand dune paths and building sand castles. You don't have the extreme low tides and high tides you can experience on the Bay side of Cape Cod. You can swim, fly a kite, or walk on the beach for a mile to Oyster River or to Stage Harbor Lighthouse. This beach is surrounded by Cape Cod sand dunes and is beautiful and peaceful. Bathrooms have been completely updated and renovated. Everything is new! There is an outdoor shower. Living room cabinets contain plenty of puzzles, dolls, building toys, toy cars, crayons, and toys for your youngster's imaginary play time. Outdoor bins are full of beach toys. The entire home has central air conditioning with two separate zones for upstairs and downstairs. We are unable to provide bed linens and towels during the summer season. WIFI and high speed internet/cable. Extremely clean, well stocked and charming rental home. Our family of 4 thoroughly enjoyed our 4 night stay! Thank you Linda and Keith for your gracious hospitality and the lovely bottle of wine! The perfect rental that has has everything one needs for a worry-free vacation neasr the beach. 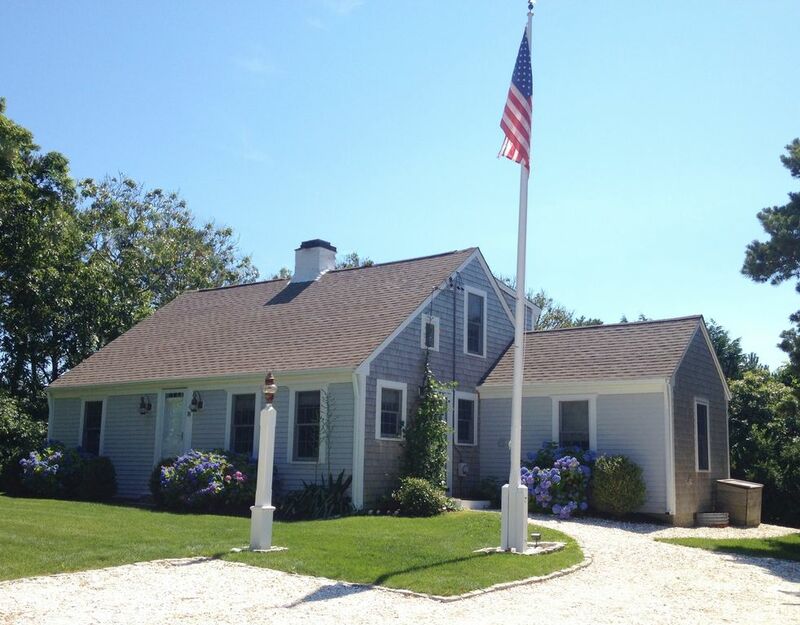 We always have a wonderful time at this beautiful little home in Chatham on Cape Cod. The owners have intuited everything one could wish for regardless of rain or shine. It was overcast for our week, but the gas logs in the fireplace kept us cozy. Everything from wine glasses to audio, visual, and board entertainment. One thing: Might be time to replace the mattresses of the bunk beds. Tough on adult backs! This home was perfect for a mid-summer getaway. The house itself is immaculate and comes fully stocked with almost anything you would ever need (beach toys, towels, etc.) The beach is a mere 5 - 7 minute walk away. Absolutely wonderful! A very special family home with a picturesque trail to the beach. This was our second year at this house with our two young boys and we plan on returning. Classic cape home in a great neighborhood. Water views only seconds away and the beach only a few minute walk or drive. Close to downtown. Linda and Keith were great to deal with, proactive in getting us details about the home and local activities and responsive to any questions. Would highly recommend!! If you're looking for a clean place that's well appointed with good taste, this is it! Easy walk to local beach, quiet neighborhood, and short drive to town and National Seashore. You will not be disappointed!! This is a great rental property in a great, sought-after neighborhood location! About a 5 minute walk to a beautiful family beach down a private neighborhood path. Walk as far as you want on the quiet, serene beach. You can walk on the beach or on the sand dune path for a mile to Stage Harbor Lighthouse. The property is about 1/5 of a mile from Hardings Beach, and less than 2 miles to Chatham's charming downtown. After a day at the beach, enjoy a dinner in one of Chatham's finest restaurants or relax on the deck overlooking the large back yard. Rates include cleaning fee and damage protection if you're staying for a week or longer. Cleaning fee and damage protection fee of $200 will be added for stays that are less than a week long. Summer rental weeks are Friday to Friday. Cleaning staff charges $125 during the summer weeks for laundering and delivery of linens and towels to the house.